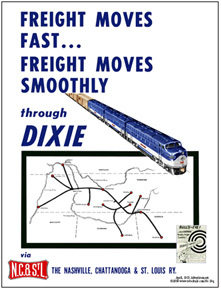 Lookout Mtn Route, The Dixie Line, To & From Dixie Land. 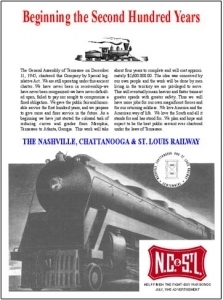 The Nashville Steam Preservation Society will be restoring #576, a 4-8-4 "Dixie" type, which will be moved from static display in Nashville's Centennial Park, for operation over the old Tennessee Central Railway trackage into eastern Tennessee. 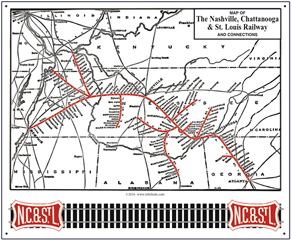 Line is now owned by the Nashville & Eastern Railroad. Much more information may be obtained at www.nashvillesteam.org. Show your support and own a piece of history in the making. Famous Civil War locomotive "The General" was owned by the NC&StL. Individual marks are licensed marks owned by CSX Railroad Company and are used under an active license agreement. 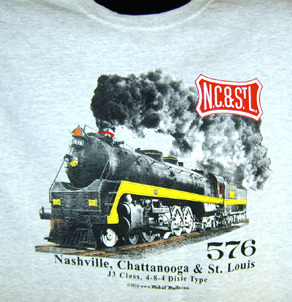 The Nashville Steam Preservation Society will be restoring #576 over the next few years for operation over the old Tennessee Central Railway. Show your support and own a piece of history in the making. An old favorite is back, the beautiful red and white NC&StL logo with To and From Dixieland script on a light grey/ash premium 100% tee. The N&C was 100 years old in 1945, folded into the L&N in 1957, now part of CSX. One of those beautiful F-unit diesels of the NC&StL Railway. Color scheme was originally used on the City of Memphis passenger train. The B-units carried steam generators for passenger use. White coffee mug with one of the NC&StL Railways many GP-7 diesels in freight colors. 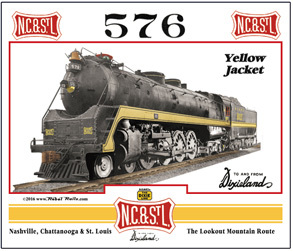 Stripe was famous as Yellow Jacket on the N&Cs 4-8-4 Dixie steam locomotives. Stripe also used on N&Cs box cars. Beautiful coffee mug with an NC&StL Railway GP-7 diesel in passenger colors. N&C had five GP-7's painted in passenger trim. Classy mug featuring the War engine #576, a 4-8-4 "Dixie Type" J3-57 class locomotive, which will be restored by www.nashvillesteam.org. Show your support and own a piece of history in the making. 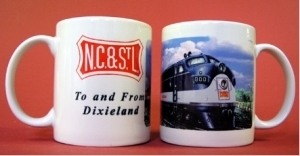 Coffee Mug features the NC&StL logo superimposed over their famous Yellow Jacket striping used on diesels and boxcars. A very impressive coffee mug. 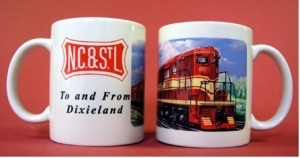 Striking classic NC&StL logo in bright red and white colors with To & From Dixieland on each side of the logo. 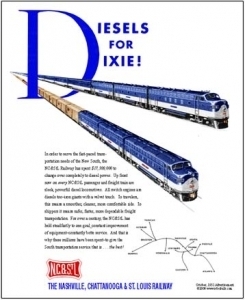 NC&StL was one of the first major American railroads to fully dieselize after WWII. 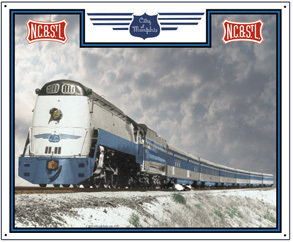 Mouse Pad featuring the beautiful City of Memphis streamlined passenger train home built at Nashville's New Shops. Some said it was the most beautiful train they'd ever seen. Was the flagship train between Nashville and Memphis. 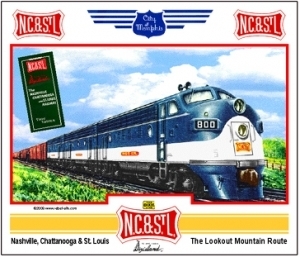 Mouse Pad featuring a builders print of a new NC&StL F-unit diesel used in both freight and passenger service. N&Cs B-unit diesels contained the steam generators for passenger service. 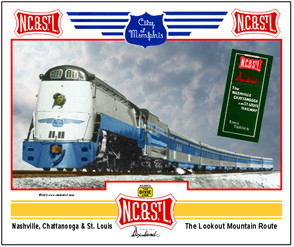 Mouse Pad featuring a builders print of a new NC&StL GP-7 diesel used in both freight and passenger service. N&Cs box cars were the same color along with the yellow jacket stripes. 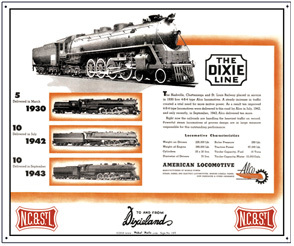 Pad features the beautiful NC&StL Railways J3 class, Dixie Type 4-8-4 steam locomotive. This locomotive may be seen at Nashvilles Centennial Park. 6 inch x 6 inch square tin Dixie Line logo sign of the Nashville Chattanooga & St. Louis Railway. 6 inch x 6 inch square tin corporate logo sign of the Nashville Chattanooga & St. Louis Railway. 6 inch x 6 inch square tin City of Memphis logo sign of the Nashville Chattanooga & St. Louis Railway. Tin Sign featuring an advertisement by the NC&StL Railway celebrating its 100th Anniversary in December of 1945. 1845 - 1945. Tin Sign N. C & St. L Diesels for Dixie sign promoting the NC&StL Railways modern fleet of passenger and freight diesels on the property. 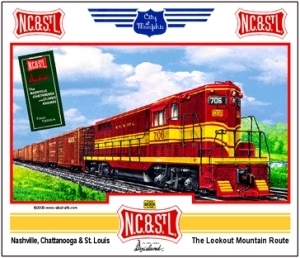 Tin Sign N. C & St. L new Diesels promoting fast smooth freight service on the NC&StL Railway with its modern fleet of new freight diesels. Tin Sign N. C & St. L map urging companies to locate on the rail line. Tin Sign of an ALCO advertisement spotlighting locomotives it had delivered to the NC&StL Railway. The number 576 may be restored for operation over the next few years. Watch for it. Tin Sign of the beautiful City of Memphis streamliner home built at the NC&StL's Nashville Shops. 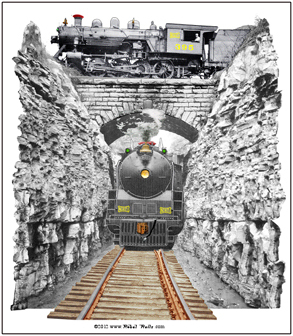 Tin Sign of an N. C & St. L fast freight rolling out of the northern portal of Cumberland Mountain Tunnel, heading down grade to Cowan, TN, just below Mount Eagle. Tracy City branch steamer pauses to take in the event. Look for tee with this design. 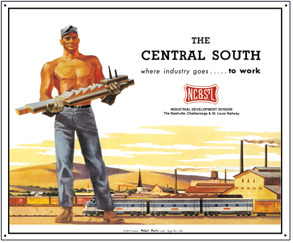 Tin Sign of an NC&StL advertisement promoting the industrial opportunities along the NC&StL Railways right of way. 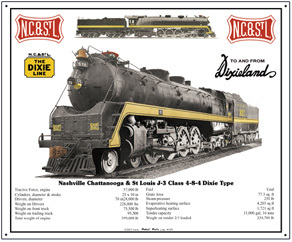 Tin Sign of the NC&StL Railways J3-57 class, 4-8-4 Dixie Type steam locomotive with builders specifications. She may soon be steaming again, more info at www.nashvillesteam.org. Show your support and own a piece of history in the making. 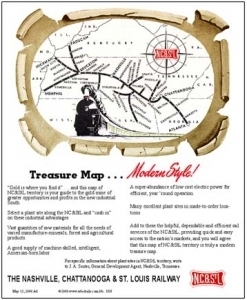 Reproduction of a 1941 system map of the NC&StL Railroad. Very interesting to see all the major and minor cities and towns served by the Nashville, Chattanooga & St. Louis Railway.